Eli, my 5-year-old, turned 6 a few days ago. He is the middle child and probably the most independent of my three children. He is able to play with himself alone for hours without asking for attention or complaining about being bored. My wife is always afraid of him getting “middle child syndrome;” because he is always self sufficient while the other two demand a lot more attention, we naturally let him be most of the time. Still, I know I love him the same and he is just as special as his brothers. About 2 years ago I did a portrait of him sleeping, holding his stuffed teddy bear and blanket. It was a gift to his godmother. I made a print of it for myself and hung it in the baby’s room. Eli is not a baby anymore, but this moment of him is now preserved. Everyone in the house is reminded that I spent my time to do this special painting of him. 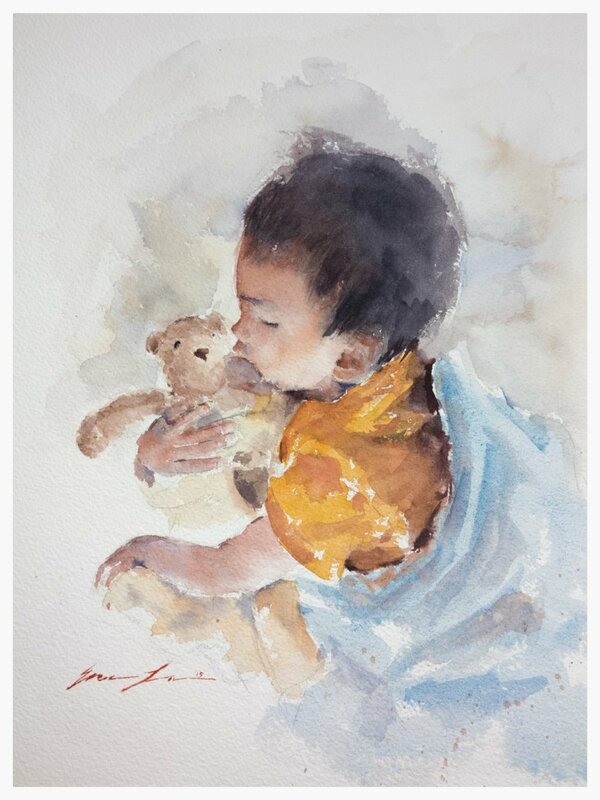 Like hand-written letters and cards, a painting is physical evidence of love and care. This painting is not for sale or show. I painted it only because I wanted to express my love to my son and my wife. I paint all three of my kids. I want them to grow up looking at the paintings and feeling daddy’s love, knowing that their father spent the time to create artwork of them. It’s times like this when I feel so blessed to be an artist — to have the ability and the freedom to create these “physical evidences of love” for the people I care about and to be able to extend this ability to serve others. This is also the reason I open courses and share my painting knowledge: I want to help others to be able to do the same.